Add the convenience of automation to your window coverings with motorized draperies from Houston Blinds For Less. Powered by Somfy®, motorized drapes provide quiet, smooth operation as they easily open and close with a simple touch. Motorized draperies easily integrated with home automation systems. Other options for controlling your Glydea motorized drapes include timers, wireless wall switches, hand-held remotes and more. Motorized Draperies provide the perfect home theater or media room experience when our room-darkening liners are added to the Drapes. Room-darkening liners also increase the privacy of a room and increase blockage of incoming light. Automatically manage heat loss and gain to lower your energy costs. Protect your furniture, valuable art and other room contents from harmful UV rays. Make your home appear occupied, improving your home security. Adjust manually during power outages. Glydea motorized systems and controls are backed by a five year warranty to give you peace of mind. 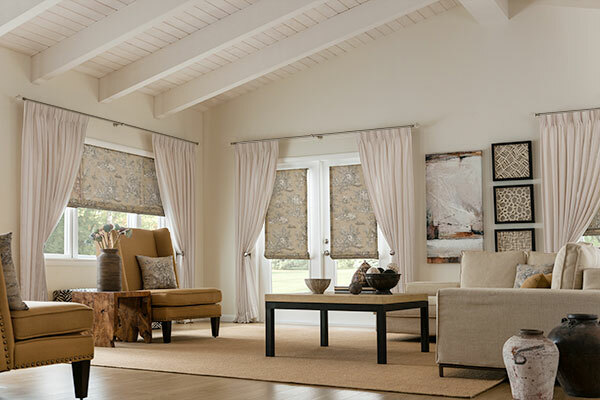 To learn more about automating your home with motorized draperies, contact Houston Blinds For Less.